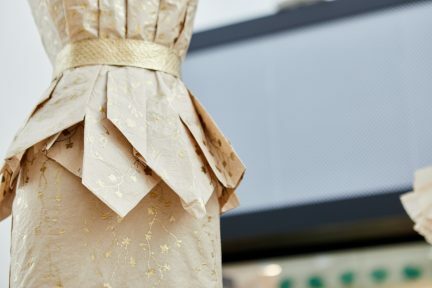 Photos by Katya Roxas, UBC Library. Katherine Kalsbeek gingerly runs her fingers down the edge of The Vancouver Weekly Herald and North Pacific News. She carefully flips through the four-page spread, shielded in mylar, pointing to stories dating back to 1886 in Vancouver. “You could spend all day just reading through the different notes about what the city was like,” she says. 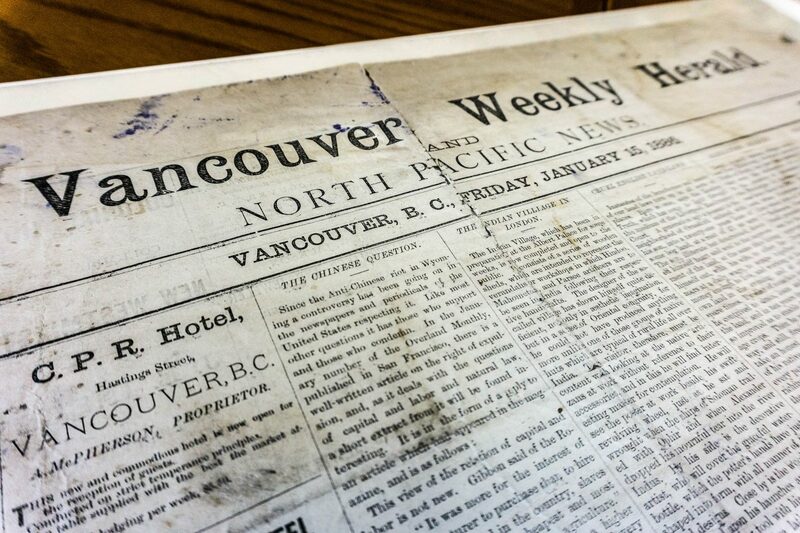 This is the oldest newspaper to have ever been published in Vancouver, and it has just joined the ranks of UBC Library’s Rare Books & Special Collections. 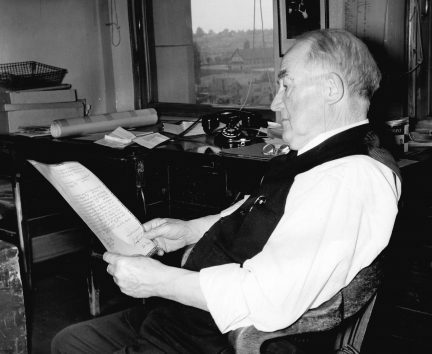 The newspaper arrived at UBC in January 2018, after Vancouver book collector Stephen Lunsford discovered it in one of his archives. “In the 1970s or 1980s, he purchased a bunch of old newspapers from a publisher in Spokane, Washington. 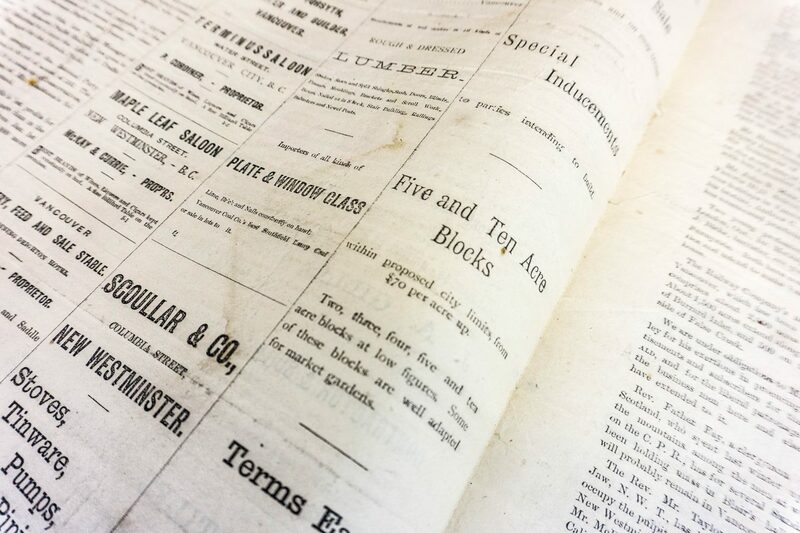 He wasn’t exactly sure what he purchased, but he purchased the lot, and then he was going through the different items in the inventory and he found this newspaper,” Kalsbeek says, explaining that what both she and Lunsford find so amazing is that a copy from this time period survived at all. It was published just months before the Great Fire of 1886, when much of the young town of Vancouver—homes, buildings, personal possessions—burnt to the ground. 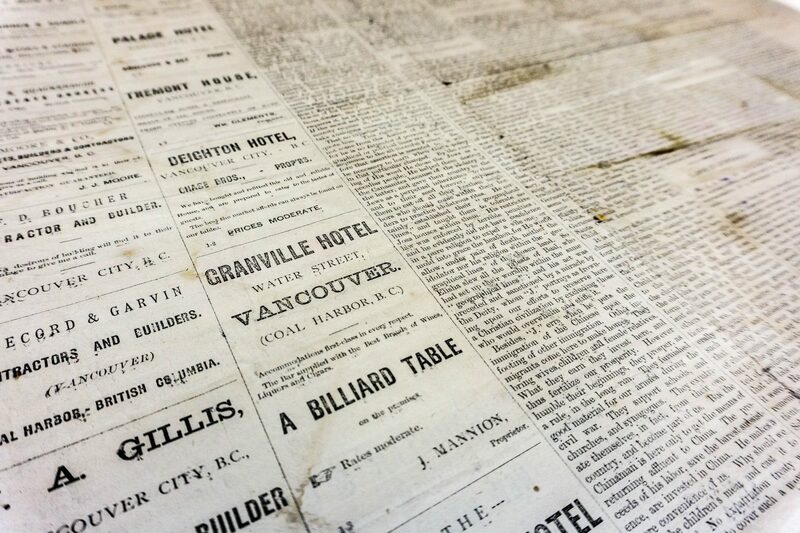 “He thinks it’s very significant because this newspaper was not actually in the city when the fire happened,” explains Kalsbeek, noting that there was only one other documented copy of The Vancouver Weekly Herald to have survived the fire; it was owned by the city’s first archivist, Major Matthews. Apparently it was in a shipwreck, though, and was too damaged to recover, making this single copy unveiled by Lunsford quite remarkable. Slowly and ever-so-gently turning the front page over, Kalsbeek reads the inner contents of the newspaper with excitement and awe. 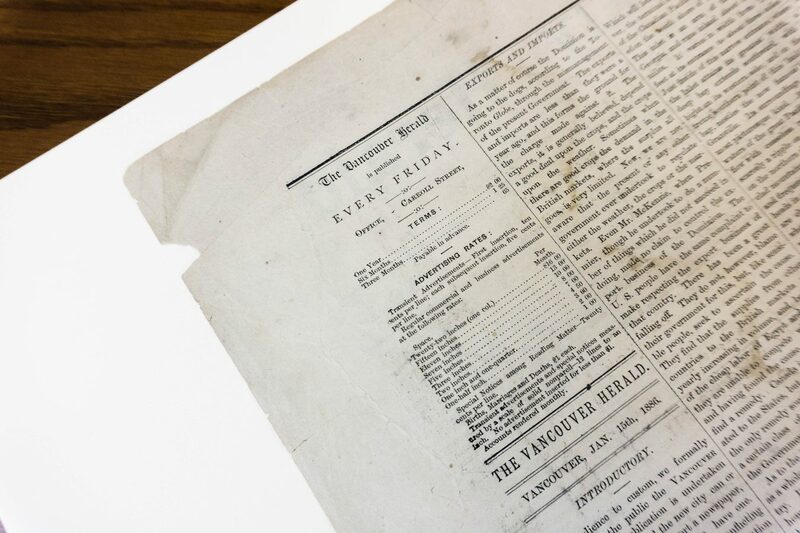 On the top left corner, an introduction to the paper is made: “In obedience to custom, we formally introduce to the public the Vancouver Herald. 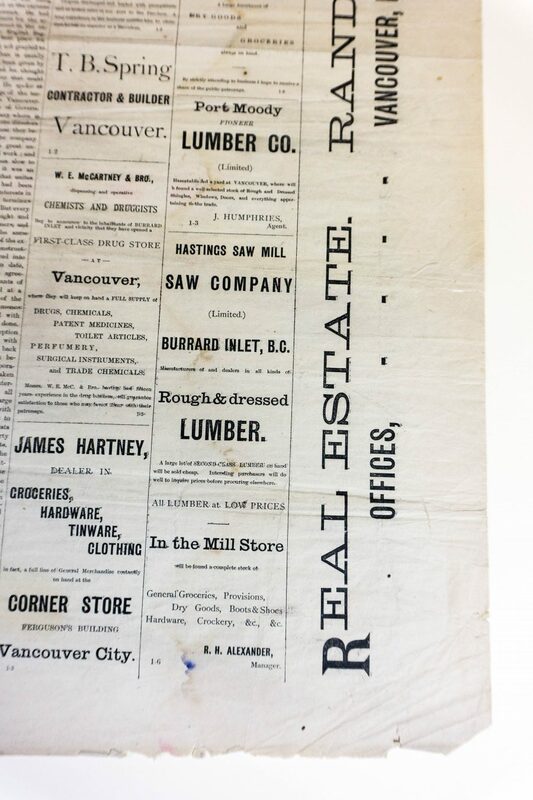 Its publication is undertaken because it is believed the new city can or will soon be able to support a newspaper, and the citizens desired to have one.” The year was 1886, meaning that the city was not yet incorporated under the name Vancouver. Up until this point, the port town was referred to as Granville, Coal Harbour, Burrard Inlet, or Gassy’s Town. But as we see in the newspaper, times—and names—were a’changing. “Each sort of advertisement is testing out this new name. You can see in some of the advertisements, Vancouver is referred to in different ways,” Kalsbeek says, fixing her eyes on the two columns filled with ads for local saloons, pharmacies, lawyers, and provision shops from around the area. On the bottom left corner, an article presents plans for the Legislative Assembly of the Province of British Columbia to vote on the incorporation of the City of Vancouver. It’s a major turning point for the history of Western Canada, and it is documented right here in these pages. The entire issue records a determination amongst citizens to change their town from a place of provisions and mills to a metropolis city of business and culture. The newspaper is something sure to be cherished by both the community and the students enrolled in history and library studies at UBC. “We have a lot of students coming through to use our materials, so that’s something that we have to take a look at,” says Kalsbeek. “So many people now read the news on their iPhone or Tablet. 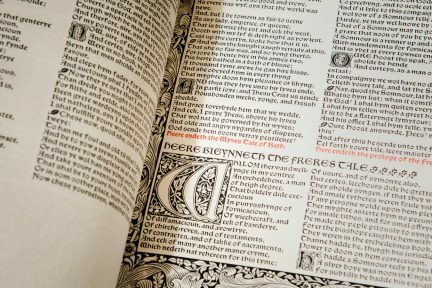 I think it’s a really good way to introduce the history of Vancouver, and history of printing in Vancouver and British Columbia, to students as a way of getting them interested.” A conservator will soon take the paper to a lab to stabilize it, because with each and every turn of the pages, the creases grow larger. 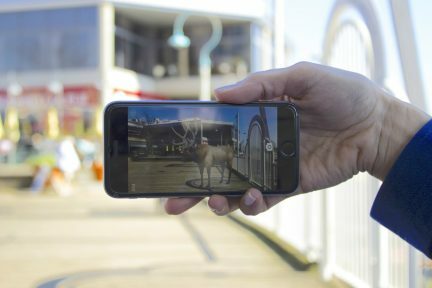 Explore more of Vancouver’s Community.